Saying good-bye to my Wild About Flowers stamp set is just so hard. Why, you ask? Well, for one thing, it is a beautiful set, and it is so easy to use. You stamp the stems with one color, the flowers with another, and boom, you're done. Easy, peasy. 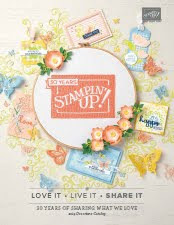 This set will be retiring from the Stampin' Up! 2017-18 Catalog this coming May 31, 2018. Should you want to order this retiring set, or any of the supplies I used to make this card, please just click Right Here to place your order in my on-line store. When you make a purchase for a minimum of $25.00 (before tax & shipping), you will earn Devoted Stamper Dividends . 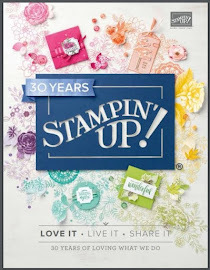 Just click on the Dividend Program button on the ribbon across the home page, to see how you can get a free stamp set from me. When placing your order please use host code J6NZ4N4A. Should your order be $150.00 or more, no need to use host code, and you will still earn dividends, plus receive rewards from SU. The first 10 on-line orders I receive in May, 2018 will receive a free gift from me. How about that!!!! The base is an 8 1/2 x 5 1/2 piece of Wisteria Wonder (retiring color) scored at 4 1/4. The Elegant Eggplant (retiring color) layer is 5 1/4 x 4. The Whisper White layer, on which I stamped my Sheet Music Background with Wisteria Wonder ink (retiring), is 5 x 3 3/4. The flower stems are stamped with Emerald Envy ink (retiring), and the flowers are stamped with Elegant Eggplant ink (retiring). The words, from You've Got This (retiring) is stamped with Emerald Envy ink, and cut out with an Layering Oval Framelit Die. The Emerald Envy scalloped background is cut out with the Layering Oval Framelits Dies.